Two months ago I talked about working with Alan from Think NOLA to provide tools and technologies for bringing together the quickly growing user-generated datasets, collaborative mapping, and historic information towards advocacy, awareness, and planning in rebuilding the neighborhoods of New Orleans. What has been most amazing about the project is that there were emergent, self-induced projects that were actively addressing many areas of capturing information. They are using Flickr for geotagged photos of historic buildings, spreadsheets of demolition permits exported as KML, and key historic maps that outline the original city planning. The project was selected as a finalist in the NetSquared challenge, which means they were given the opportunity to come out to San Jose to meet with the other 20 projects and discuss their ideas, goals, progress, and cooperations. While the conference itself will award three top-voted projects with funding, the point of the conference and discussion isn't solely this monetary support. 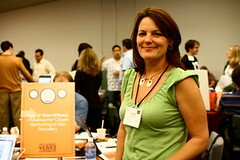 In planning for the conference, the entire discussion occurred publicly on Alan's Blog at http://thinknola.com/post/gis. Through open discussion, numerous other projects and individuals contacted Alan to share support, data sets, ideas and future collaborations. NetSquared served as a catalyst for focusing a specific set of projects, but the longer effect is that it has brought together people that will carry the project forward and make sure everyone succeeds. 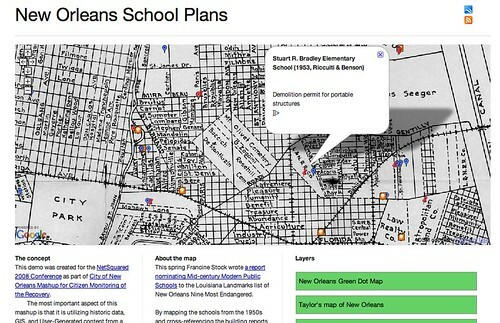 As a prototype, I used Mapufacture to combine together Francine's Flickr photos, planning documents of school rebuilding, and the 1924 Taylor's planning map of New Orleans. It is just a simple demonstration of what is possible using a combination of Neogeography, GIS, and community participation. The next step will be to build better tools for basic analysis and discussion. In addition, the data is open and available for other people to download for their own visualizations, analysis and collaborations.